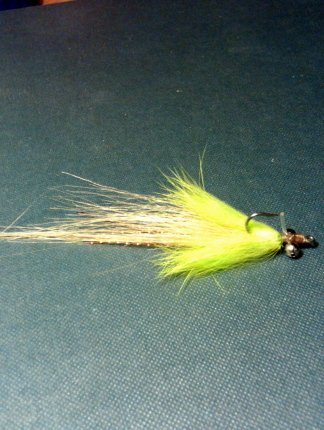 This fly came together from left over pieces of material after tying a few crab patterns and tarpon flies. I like flies that I can tie fast! The redfish hammered this pattern over the gr***y flats in out westside lagoons! I am sure it would have worked on the eastside sand flats but just never left the fish on the westside! [image]http://www.mbcforum.com/fbbuploads/1289887290-Remnant_Fly.jpg[/image] Tuft of select craft fur with one strand of copper flash. Crosscut rabbit strip and bead chain eyes (varied for sink rate) on a 34007 mustad #6. [image]http://www.mbcforum.com/fbbuploads/1289887845-Remnant_Fly.jpg[/image] [image]http://www.mbcforum.com/fbbuploads/1289887871-100_0012.JPG[/image] This is the first redfish to succumb to the Remnant Fly! The fly looks good too. That fly looks great! Caqn't go wrong with chart/white in stained or muddy water. Bet it would work in burnt orange and white in clear water too! Your right! But I'll have to do a few in maroon and white so my ten year old won't get mad! I have only eight more years or so to change his mind! Guess their could be worse things to deal with though! If that is the least of your worries, God bless. Raised four boys. In my old stomping grounds the choice was Maize and Blue or Green and White. PS: Almost forgot...try artic fox in place of the craft fur. It will pulsate with the slightest movement. Yes it does! I use that for crab flies instead of marabou!